There are two great walks that start and finish at Lawrenny Quay - please click the links below to download maps and information for the walks. Lawrenny Ferry by Sir Francis Dashwood, BT., M.A. From Lawrenny Ferry you see Cosheston on the opposite bank across the Creswell Estuary. To the left the Estuary divides; one branch leads to the little village of Creswell Quay with the ruined monastery of the black friars and the never failing well of pure water; the other leads to the historic castle of Carew where in the 15th century Sir Rhys ap Thomas held court in great magnificence. Across the Haven stands 13th century Benton Castle, once the home the de la Roches, descendants of Godeburt the Fleming. Lawrenny Ferry is in fact surrounded by the trappings of history, but for most of the time it played the role of onlooker at the events which ebbed and flowed around it. In very primitive times, this area must have been all but deserted except for the herds of reindeer, horses, bison, elephants and rhinoceroses and the occasional hippopotamus which strayed here from the fertile plains of the Bristol Channel, hunted by lions, bears and hyaenas which lived in caves, and also by man their great enemy and destroyer. By 1700 B.C. the Milford Haven was well known as a seaway, for it was about that time that the famous bluestones were moved from the Prescelly Mountains to Canaston Bridge and down the Milford Haven to Stonehenge. 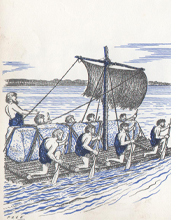 Altogether some eighty stones weighing up to four tons each were transported overland to the Milford Haven where they were lashed to rafts for the next stage of the journey to Stonehenge. The distance as the crow flies was 135 miles and the operation must have involved at least 5,000 men. Further up stream the huge altar stone 16' x 3.5' x 13' was being hewn out of the Cosheston beds at Langwm, while just around the corner from Lawrenny Ferry another gang was at work on the bed of micacious sandstone at Mill Bay. Somewhere in the Haven between Lawrenny and Coedcanlas is supposed to be one of the huge stones having sunk on its way from Prescelly. We do not know the purpose of this Herculean task. Certainly it had religious significance. The Beaker people of Wessex, in their trade with Ireland, then the principal source of metal in N.W. Europe, no doubt came to hear of the spotted dolerite which was to be found in abundance on the Prescelly Mountains. Here was the material for their primitive tools and axe-heads which contributed to their economic and military strength. 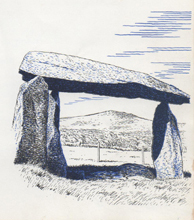 This part of Wales abounds with cromlechs of that period testifying to the existence of an earlier civilisation here. But the beaker tribes of Wessex were the dominating force and transferred the religious centre of power to Stonehenge and Wiltshire. Legend also associates Arthur and his Knights of the Round Table with this part of the country, and the numerous mounds and pillars scattered over the hills bear the names of those heroes of the 5th Century A.D. The next events of importance which Lawrenny was to witness on the Haven, was in King Alfred's time the arrival of Hubba the Norsman who wintered in the Haven with twenty-three ships and plundered the land of the Welsh Kings. They were followed by the well organised invasions of the Normans in the 12th and 13th Century. The Normans quickly realised the strategic value of the peninsular of land abounded by the Bristol Channel on the one side and by the Milford Haven on the other. From it, an army supplied by the sea could be thrown right into the heart of Wales. This was why the Normans made this corner of Pembrokeshire almost impregnable with a great chain of fortresses, having as their corner stones Pembroke, Carew, Manorbier and Tenby, with lesser ones between. The lines were so strong that this area apart from Tenby escaped spoliation during the long war of the 13th and 14th centuries which ended in the destruction of Welsh independence. The sea route continued to be the safest and quickest for generations. Well into the railway age it was easier to get to this south western corner of Wales by sea from London, than by land. 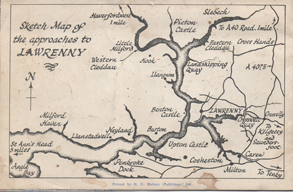 A Carew man returning from London, took a ship round Land's End to Bristol; a smack from Bristol to Milford and a boat from Milford to Lawrenny Ferry, and thence on horseback to Carew. Some years later in 1405, Lawrenny again witnessed an invasion this time by the French who had come to the assistance of Owen Glendower. The line of march seems to been from Haverfordwest to Tenby, and no doubt all the district was devastated and ravaged en route. The Flemings under Francis a Court, quickly came to terms with Owen on this occasion, and agreed to raise a rate of £15. 2. 8d on the district lying between Picton Castle and Scotsboro which included Carew and Lawrenny; the later was assessed for 26/8d, as a tribute to avoid further trouble. Lawrenny being a waterside place may have already been plundered by the fleet and this may have been why it was assessed for this rather small amount. From early in the 12th century, Lawrenny had belonged to the Knights Hospitallers of the order of St. John of Jerusalem. This order had its headquarters or commandery at Slebech, further up the Haven on the banks of the East Cleddau (on the route followed by the Stonehenge stones). It was one of the principal centres in Britain of this powerful crusading order. The Sword of Slebech which was dug up in the 19th century on the island near the cemetery of the old church in Slebech, is the one which is carried by the Grand Prior on public occasions today. With the dissolution of the Hospitallers in 1540 by Henry VIII the former tenant of the order at Slebech, Roger Barlow, with his brother Thomas, bought from the Crown the Slebech lands, including Cresswell Chapel which had belonged to the suppressed priory of Haverfordwest, and Lawrenny. Roger Barlow was the first of the Barlows of Slebech, and over the years he continued to enlarge his estate by purchase. In 1553 he bought out his brother's interest and became sole owner. Barlow was typical of the new Tudor Magnates. A successful merchant of Seville, explorer and sponsor of voyages of discovery, he had sailed with Sebastian Cabot and was the first Englishman to set foot in the Argentine. One of his ambitions was to open up a new English trade route to the Spiceries by way of the North Pole, but the expedition got no further than the Rio de Solis, the great gateway of South America, and was abandoned. Barlow soon became a power in the land. His brothers held various ecclesiastical posts and as a family they enjoyed the patronage of Anne Boleyn and Thomas Cromwell. In 1540-1 Barlow put forward a project to Henry VIII to discover a Northern passage to the East Indies. In it he describes his neighbours at Slebech as "very actyve in feates of arms, good horsemen and bowmen." Henry's death in 1547 is said to have prevented him setting out with three of his Majesty's ships from the Milford Haven. The Barlows continued at Slebech until the end of the 18th century. In 1792 Slebech was bought by Sir Nathaniel Phillips, a wealthy sugar planter and merchant whose daughter married Charles Frederick, Baron de Rutzen, a descendant of Field Marshal Potemkin, favourite of Catherine the Great of Russia. The Barlows continued at Lawrenny until 1851, when Sir William Owen Barlow died. The family connection is still maintained through Col. Patrick Lort-Phillips who lives on his estate at Lawrenny. Lawrenny Ferry's chief claim to fame lies in the part it played in the coal trade. John Leland in his tour through this part of the country between 1538 and 1544 had noted how extensively coal was used. "On every side sumwhat distant I saw vallies and on hillsides good corn. But the ground is somewhat baren of wood as al Pembrokeshire almost is except where a few Parks be. But the ground in various parts of Pembrokeshire bereth se coles wherewith communely the people make fier with fires. 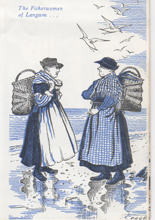 By one of these cole pittes, being four miles from Llanfeth, I came." This pit must have been near Cresselly, four miles from Lawrenny, where there were abundant supplies of good anthracite. By the 18th century the Cresselly pits were being intensively exploited. Fenton in this tour of 1811 describes how the anthracite was shipped out. "After a repose, such as the desultry tourist cannot often ensure himself, I take a boat at Cresswell, where there is a quay for the shipping of coal vessels of smaller burthen than those that load at Lawrenny and in large lighters that carry them. The colliery is principally the property of Mr. Barlow and Mr. Allen. Here formerly stood a chapel called Christ's Well Chapel." Then he sailed past Lawrenny, "where large vessels take in coal and culm brought them in barges from Christ's well quay and lies here safe and three fathoms at low water; but the place is likely to be much ignored in a few years, unless gentlemen in power, and particularly those who are more immediately concerned, will prevent vessels from throwing their ballast into the channel, thereby choking the passage." These large vessels at Lawrenny Ferry dumped their ballast on the shore and in this way the grassy beach known as the Ballast Back, was formed. 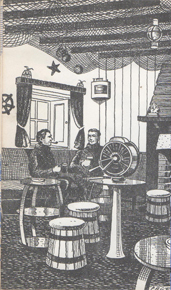 To cope with this growing activity a pub was opened at the Coaches, and a shop at the Ferry Cottage. In 1855 the latter was occupied by John Griffiths whilst the Davies family leased the Ferry and the Ballast Back. Another popular sport centred on Lawrenny Ferry was fox-hunting. 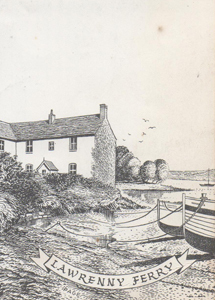 In the latter part of the 19th century the Lawrenny hounds were kept in the Kennels behind the Lawrenny Arms. They were hunted by Colonel Frederick Lort-Phillips. The kennelman George Davis and huntsman George Merriman lived in the cottage by the Lawrenny Arms. A horse boat was kept at the Ferry, and the hounds were taken to Cosheston to hunt there as well. Colonel Lort-Phillips, besides hunting two packs, was a leading steeplechase trainer. In 1905 he won the Grand National with Kirkland, ridden by Tich Mason. Many of the leading owners, Sir Tatton Sykes, Mr. W. Astor, The Earl of Lonsdale, the Marquis of Londonderry, Mr. Leopold Rothchild and the Earl of Zetland sent their mares to be put to his famous stallion Missel Thrush. With the departure of the hounds in 1897 and the closing of the anthracite pits a few years later, Lawrenny Ferry suffered an eclipse. The Ferry went on carrying passengers to and from Cosheston, Benton and Pembroke Dock for 6d. until 1950. The war however brought new life. A slipway was built and Lawrenny Ferry became a base for Walrus Flying boats and Catalinas, becoming in 1942, an Advanced Seaplane Training School. Then in 1955, Colonel Lort-Philips started up a Yacht Club with Colonel Lee and Mr. Brian Andrews. The slipway was extended and the old facilities consisting of a pub and shop were reopened but in different buildings. 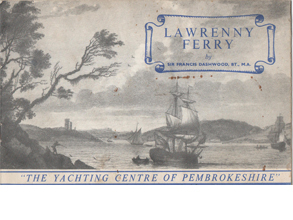 In 1965 Colonel Lort Phillips sold Lawrenny Ferry and it is now being developed as "the yachting centre of Pembrokeshire."